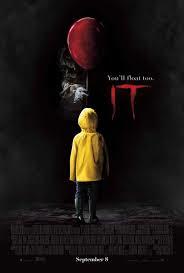 The movie “IT” can be considered the biggest hit of 2017. The first version of this movie, in 1990, was way different from the characters to how the whole movie progressed. This movie has stepped its game up from the past years with more action and comedy in one, with a length of two hours and 15 min, being a Rated R film. The movie is more about seven kids being bullied from a monster, a clown, who just hunts for kids. It is, in some ways, the remake of the first IT. In 1990, the first movie looks more simple and just not enough amusement, in other case the remade one Pennywise looks more scary and creepy and the effects which gets more people to want to watch it. After going to watch this movie, I was more worried how good will it be, but since this one was divided into horror parts which could give people the chills, with also the comedy which gives some time for people to laugh about what the characters say, which I love. It focus on more than one element not just directly into just being a horror movie, more of getting scared and having some laugh. Overall, they’re just different emotions. This newer version of IT also just gave a different vibe to it, didn’t look boring having the colors be a part of it as well, which makes people get into it or not. The movie suggests more effects and an entertaining, yet scary, film that comes together. When they took the brother and soon the clown is just tormenting the kids it’s all amazing but they fight to destroy Pennywise. It just gives the vibe of having strength even if you are afraid, it shouldn’t stop you. “IT” movies are like that. It brings different emotions in one whole film and you never know what to expect.